Veteran healthcare worker Trisha Hagen has taken her unique set of people skills and applied them to teaching the next generation of safe drivers. 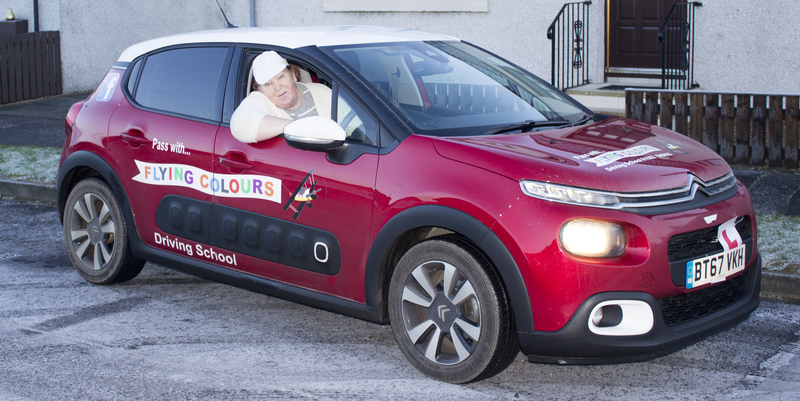 Covering the Fife and Kinross areas, Trisha’s Flying Colours Motoring School in Scotland has been successfully operating for over a year. Here the 55-year-old instructor Trisha tells us why she made the move from working in healthcare to instructing – and what learners must do to give themselves the best possible chance of passing the practical and theory tests. Before I became an instructor, I worked in healthcare for 15 years. I was a support worker for people with autism and dementia. I loved the job but felt that I needed a change and a fresh challenge – so here I am! I was inspired to become an instructor by my son. He is difficult to teach at the best of times because of his learning disabilities. He really has to be shown what to do multiple times and it took a number of years for me to teach him to drive. I realised though that I really enjoyed the teaching process and its challenges. So when I was looking for a career change, I kept noticing an online ad from a major national driving school that often popped up – so I applied. I have now been teaching for four years. How did you find the process of becoming an instructor? It was simple for me. I am quite academic and excel in most areas. What I soon realised though was the school wasn’t teaching you how to actually teach people! They were only teaching you how to pass your exams. So when I did pass, I was simply left to get on with it. I found it very daunting at first as no one ever took me out in a car and said: “Right, in lesson one, this is what you should do with your learners. In lesson two, you should do this”, and so on. I only knew how to find errors, analyze them and remedy them. I worked with the national driving franchise for a year and then moved to a local one. It was an important move because I wanted to learn about the local area and its specific wants and needs. I built up my skills and then decided it was time to go it alone in December 2017. It’s been going really well and I aim to build on my success in 2019! I am a very person-centred instructor. A lot of ADIs will get in the car and say: “Okay, we’re going to do X, Y and Z today”. I try not to do that and always get the client to be more involved in the process. I say: “What would you like to do today? What areas do you want to concentrate on?”. So they may say that they did roundabouts the previous week but they still aren’t confident about navigating them – so we will go and do more roundabouts. This approach is almost like a partnership but with me guiding the client so they get the very best from each lesson. I also allow them to make mistakes in a controlled environment as one of the quickest ways to pick something up is by learning from your mistakes! – Trisha on how her past career has informed her instructing style. I really love it when I have a pupil who has a particular problem and we work together to overcome it. For example, I’ve got a client who came to me after a 35-hour intensive course but still had serious anxiety issues about roundabouts. We worked on the issue together and just before Christmas, they cracked it! The penny dropped and they overcame their fear. That is real job satisfaction – breaking down barriers and getting clients over any hurdle. The least favourite part of my job is the paperwork. I do wish I could afford an admin assistant! Doing the books, tax returns and records is a bit of a drag. What advice would you give to students to ensure they get the best out of their lessons? I always advise my clients to start off very slowly. Don’t expect to just get in the car and within five minutes, be able to drive! A lot of folk get frustrated because they make mistakes over and over. But remember to try and not get frustrated – in a two-hour lesson, you have to take on so much information that it takes time to digest. It’s all about staying relaxed, staying calm and staying focused. Don’t worry about what’s happening at home or at work. Just focus on the moment as 95% of driving is about concentration. That’s the key to being a safe driver. What I like is the way that I can go on to the website and see what clients are doing – what their strengths and weaknesses are – and I can take that into the next lesson. I can say to them that I see they are struggling with X, Y and Z, and we can go through it there and then. It means I am more informed as an instructor about their progress. I also like the wee button to the side which says: “Ask Trisha”. My clients love to use that! As a system, Theory Test Pro is also very easy to use and always has fresh content. I’ve looked at other theory test apps that my clients use and I find a lot of them are simply not updated properly. If you involve your pupils in deciding what areas need attention, encourage them to ask questions and teach at a rate that’s in tune with their needs and ability, the rate at which they improve can be surprising. After passing they’ll also be safer and more confident when driving alone.